^ Tombaugh, Clyde W. (1946). “The Search for the Ninth Planet, Pluto”. Astronomical Society of the Pacific Leaflets 5: 73–80. Bibcode: 1946ASPL....5...73T. ^ Crommelin, Andrew Claude de la Cherois (1931). “The Discovery of Pluto”. Monthly Notices of the Royal Astronomical Society 91: 380–385. Bibcode: 1931MNRAS..91..380.. doi:10.1093/mnras/91.4.380. ^ Nicholson, Seth B.; Mayall, Nicholas U. (December 1930). “The Probable Value of the Mass of Pluto”. Publications of the Astronomical Society of the Pacific 42 (250): 350. Bibcode: 1930PASP...42..350N. doi:10.1086/124071. ^ Nicholson, Seth B.; Mayall, Nicholas U. (January 1931). “Positions, Orbit, and Mass of Pluto”. Astrophysical Journal 73: 1. Bibcode: 1931ApJ....73....1N. doi:10.1086/143288. ^ Kuiper, Gerard P. (1950). “The Diameter of Pluto”. Publications of the Astronomical Society of the Pacific 62 (366): 133–137. Bibcode: 1950PASP...62..133K. doi:10.1086/126255. ^ Christy, James W.; Harrington, Robert Sutton (1978). 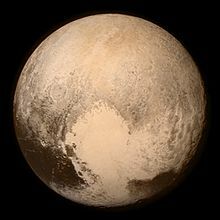 “The Satellite of Pluto”. Astronomical Journal 83 (8): 1005–1008. Bibcode: 1978AJ.....83.1005C. doi:10.1086/112284. ^ Seidelmann, P. Kenneth; Harrington, Robert Sutton (1988). 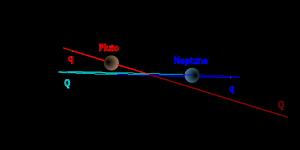 “Planet X – The current status”. Celestial Mechanics and Dynamical Astronomy 43: 55–68. Bibcode: 1987CeMec..43...55S. doi:10.1007/BF01234554. http://www.springerlink.com/content/r42h4u7232t724uq/ 2016年2月6日閲覧。. ^ Lellouch, Emmanuel; de Bergh, Catherine; Sicardy, Bruno et al. (2015-01-15). “Exploring the spatial, temporal, and vertical distribution of methane in Pluto's atmosphere”. Icarus 246: 268–278. arXiv:1403.3208. Bibcode: 2015Icar..246..268L. doi:10.1016/j.icarus.2014.03.027.